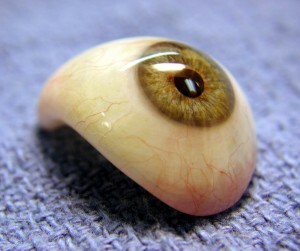 Prosthetic Eye Fitting Methods | Ocular Prosthetics, Inc. There are a number of factors that will determine what type of fitting method your ocularist chooses to fit your prosthetic eye. It is important to note that each fitting method is equal in value and specifically chosen to achieve the most desirable outcome for your situation. Your ocularist will take into consideration your eye socket anatomy, surgical history and any prosthetic eye history when considering which method is best suited to your needs. The empirical fitting method is best characterized as the experienced observation method. Key indicators for this fitting method are eyelid anomalies such as entropion (inward turning of the eyelid), ectropion (outward turning of the eyelid), ptosis (drooping eyelid) and small palpebral fissure (eyelid opening). These eyelid malpositions are best corrected with uniquely designed shapes that manipulate the eyelid into a more functional and cosmetically pleasing position. The modified impression fitting method builds on the tenants of empirical fitting with the addition of an alginate mold of the eye socket. Much like having an impression of your teeth made at the dentist, your ocularist will insert a cool cream through a fitting tray to capture your unique eye socket anatomy. This fitting method is a great way to transfer movement, ensure flush fitting comfort and achieve symmetrical lid alignment. It is important to reiterate that neither fitting method is more intrinsically valuable in the cosmetic, functional or comfortable wear of your prosthetic eye. Your board certified ocularist, based on years of combined experience in team approach setting, will determine which method will suit you best. For more information on the differences between these two fitting methods, we encourage you to speak with your ocularist.